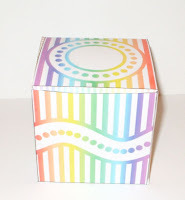 I finally made a box template that will fit a standard size cupcake. Figuring out how to get a cupcake in it without getting icing on your fingers is your challenge. I realized a bit too late that I really should have used tongs or something to get it in the box and you can see stray bits of icing on the box. This will take 3 sheets of card stock to print.I'm sorry for that, it can't be helped. A standard size cupcake needs a 3 inch box at least, and the insert wouldn't fit with the box parts. I did put two inserts on on page though so if you print 2 piece ones, 2 piece 2, and 1 insert, you've got enough for 2 boxes. What you'll do is print, score, cut as usual, piece 2 has the bottom square, and piece 1 has the top square. Glue the tab on the edge of piece 1 to piece 2 so the bottom square goes the opposite direction of the top square,then complete the box by gluing the side tab of piece 2 to the edge on piece one. Tuck the bottom flaps and the bottom square in, glue it if you want a little more security. Score and cut the insert, then poke a hole in the middle with your scissors and cut out that inner circle. That's where the cupcake will rest. 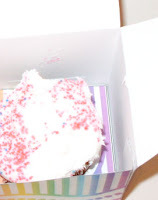 Put the insert in the box, and then the cupcake. Close box. 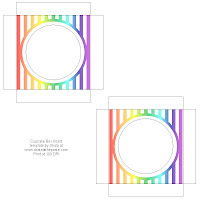 Design with the help of my daughter who loves polka dots and pinstripes and anything rainbow colored. As usual, click on the images for the full sized version. I hope you like it. Cupcakes in image are store bought. I still can't figure out where my cupcake tins are. Aww,that is so cute! How exciting it would be to receive a cupcake in this! Thanks so much for all your sweet printables. I'll be linking. Thank you! My daughter has egg allergies so I am always making one cupcake for her to take to school. I could see spending 5 dollars for a plastic one. This is perfect!!! Great box. You can also cut out the circle on the top flap and glue a piece of acetate on the inside so that there is a window to show off the cupcake. I love this cupcake box, it is perfect when you just want to give one cupcake to a special person, in a special way...love, love , love it.